With at least 40% new or updated content since the last edition, Clinical Decision Support, 2nd Edition explores the crucial new motivating factors poised to accelerate Clinical Decision Support (CDS) adoption. 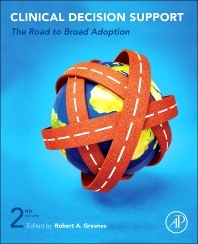 This book is mostly focused on the US perspective because of initiatives driving EHR adoption, the articulation of 'meaningful use', and new policy attention in process including the Office of the National Coordinator for Health Information Technology (ONC) and the Center for Medicare and Medicaid Services (CMS). A few chapters focus on the broader international perspective. Clinical Decision Support, 2nd Edition explores the technology, sources of knowledge, evolution of successful forms of CDS, and organizational and policy perspectives surrounding CDS. Exploring a roadmap for CDS, with all its efficacy benefits including reduced errors, improved quality, and cost savings, as well as the still substantial roadblocks needed to be overcome by policy-makers, clinicians, and clinical informatics experts, the field is poised anew on the brink of broad adoption. Clinical Decision Support, 2nd Edition provides an updated and pragmatic view of the methodological processes and implementation considerations. This book also considers advanced technologies and architectures, standards, and cooperative activities needed on a societal basis for truly large-scale adoption. 17.11 What needs to be done to allow sharing of decision logic? 21.5 Beyond the standards – what is needed for widespread CDS adoption? 21.6 How important are standards?